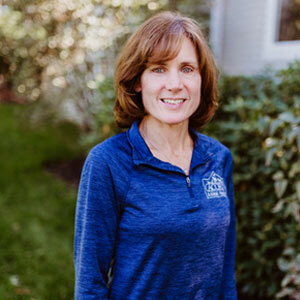 Dr. Martha Bugbee grew up in Wilbraham, Massachusetts and attended the University of Vermont as an undergraduate. She graduated in 1986 with a Bachelor’s of Science in Animal Science. She then went on to attend the University of Pennsylvania School of Veterinary Medicine, graduating in 1990. After graduation she completed an internship in small animal medicine and surgery at the Angell Animal Medical Center in Boston, Massachusetts. Since completion of her internship, she has been practicing small animal medicine and surgery, joining the staff at Acorn Animal Hospital in 2001. She lives in Norfolk, MA with her husband Dr. Andrew Weitzman and their 3 children, 2 dogs and 2 cats . In Dr. Bugbee’s free time, she enjoys running, horseback riding and skiing with her family.